So what's the purpose of this post? 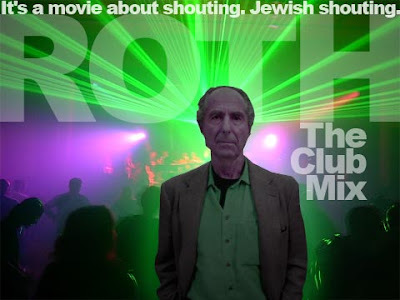 Well, after several weeks of tinkering, I finished the nine-and-a-half-minute Jewish Shouting Cantina Club Mix. It's got lap steel, church bells, a danceable beat suitable for your next bar mitzvah or Rotary Club meeting, and (again) the inimitable vocalise of Philip Roth. You can listen to it or download the convenient, spill-resistant MP3 file here. As always, feel free to pass it along: sharing is caring. And now I will resume normal broadcasting. I promise. Marcus: Questions of style aside, then, what did you take away from him as a young reporter? Hamill: His delight in the raffish. My second year at the Post, I pulled the 8:00-to-3:00 shift, covering Broadway. I’d go to Lindy’s, where I would nurse a single cup of coffee because I was broke, and talk to the press agents and the flacks. These were the kind of characters that Liebling would write about. By 1962, of course, they had mostly disappeared. They had gone to Vegas to do legally what was illegal in New York. Marcus: So you caught the tail end of that scene. Hamill: I did. But it taught me to pay attention. Once I found a house detective at the Hotel Taft named Tiptoe Tannenbaum. If Liebling didn’t invent him, Runyon did. Southern political personalities, like sweet corn, travel badly. They lose flavor with every hundred yards away from the patch. By the time they reach New York, they are like Golden Bantam that has been trucked up from Texas--stale and unprofitable. The consumer forgets that the corn tastes differently where it grows.